APPEARANCE: Poured a devilish black oil slick color. My snifter produced little to no head, the teku pour produced a small khaki colored head that settled into a nice halo. Head has stuck around with some spotted lacing, that is slow dancing down the glass. AROMA: Instantly hit with black licorice and molasses. Reminiscent of bourbon county brand stout on the bouquet. Smells of rich dark chocolates and deep dark fruits, currants, plums and ripe plump raisins. Faint aroma of coffee beans hiding under the layers. Smells sweet and boozy at the same time, such an inviting aroma. 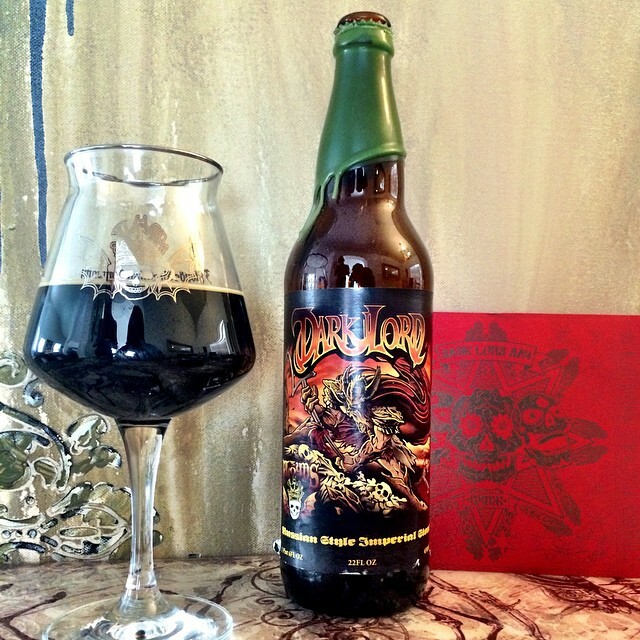 TASTE: I just made a deal with the devil, sold my soul for a bottle of beer! Amazing, chocolate covered cherries, floating on a bed of sweet malts. Intense flourishes of burnt caramelized fruits with a toasted nuttiness. The chocolate and sweetness gives way to nice warming alcohol heat that finishes with a nice port wine like flavors. If i had this in a blind taste, I would bet the house this was a barrel aged beer. I’m a huge fan of vanilla and this delivers an immense slap to the taste buds of Madagascar vanilla beans. Delicious! MOUTHFEEL: For a hard pour that produced almost no head I was expecting a almost lazy flat beer.I was wrong, prickly hidden carbonation that expands into a wonderful creaminess with each sip. Nice burn from the high abv with a dry lingering finish that leaves the flavors hanging around for an eternity in my mouth. OVERALL: As far as a Russian imperial stout goes, this gargantuan beer is the best I’ve had to date. The layers upon layers on both nose and pallet seem to be ever evolving. The sweetness is forefront without being cloying, the alcohol is present without being overbearing. All around an amazing beer for the style and amazing beer in general. The Dark Lord has risen! This entry was posted in Beer Reviews, Stouts/Porters and tagged #beergeek, #beerme, #beernerd, #beerporn, #beerreview, #beerzombies, #craftbeer, #craftbeerlover, #dtlv, #imperial, #lasvegas, #lv, #ris, #russian, #sincity, #stout, #zombie, #zombies, black licorice, chocolate covered cherries, chocolate covered cherries jubilee, coffee beans, Dark Lord, IBU, malt profile, NoDA Brewing Company ABV, russian imperial stout by beerzombies1. Bookmark the permalink.